Rainbow Art is unique. It’s the only product of its kind that lets your child paint multiple colors simultaneously without the colors mixing. Your child can also learn geometric shapes, color combinations and better manual dexterity. Imagine your son or daughter developing motor skills while enjoying hours of creative fun. Open your childs eyes to the world of color. 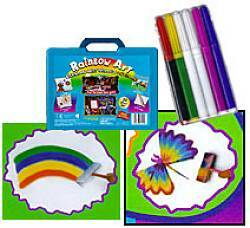 There’s a howle spectrum of imaginative pictures your son or daughter can create with Rainbow Art.